Mobile phones are one of the most used gadgets of today. Through them, we are carrying our phone and our computer in just one small and compact gadget. We don’t need to be lugging around heavy laptops and annoying cords. This is why many people look forward to new releases in order to get a feel for what the future will be. However, not all phones are created equal. Some excel in the phone industry that can be Apple, Samsung or something else other than the two. Others, well, not so much. It’s not that they were useless inventions but they are just downright weird that they alienated the people. If you want to know what I mean, check them out for yourself. 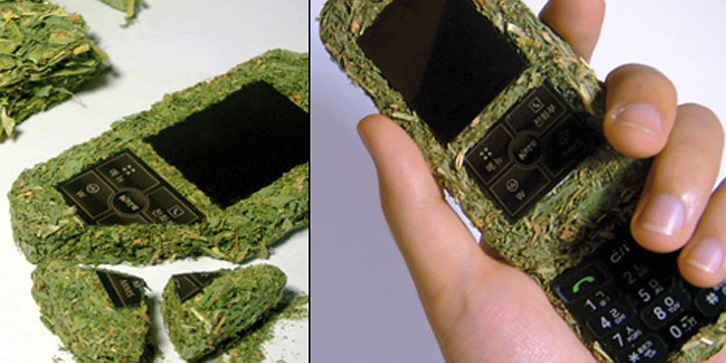 Here are some unusual cellphones ever created. Designer Hiroyuki Tabuchi created a concept where phones will be able to mimic their surroundings just like a chameleon, thus the name. It sounds so cool and very unique at first. That is until you thought of the possible problems that it may give you. It’s already hard enough for me to keep track where I put my phone and I bet that I’m not the only one who deals with that dilemma. However, if you wanted to really play hide and seek with your phone, you might want to try Chamelephone. That or you can always install an app that can help you find it. Nokia phones have a soft spot in my heart and personally, I think this phone is very cute. Aesthetics and biases aside, this phone will be uncomfortable to use. Not only that it is small enough and easy to lose, it is not small enough that you can handle it with one hand. Even though that this phone aims to become a fashion statement, the usability is one of the things that made it fail. Imagine yourself typing around that just to text someone, your hand will definitely hurt right after. Speaking of fashion statement, this phone might also be aiming for that. Looking like a compact mirror and being all shiny and shimmering would want to attract the female population. However, with the hefty price tag, this is one of the most expensive phones from China. And why wouldn’t it be pricey? The Golden Buddha Phone is equipped with a piece of real jade, pearl powder lacquer, and a glossy 24 karat gold coating. Fashion statement, indeed. However, would someone buy this expensive phone and openly use it in public? I doubt that. Before you get excited, this is actually not real weed. It’s dried and hardened hay colored in to resemble grass. Which looks like a brick of weed as the end product. The designer of this phone, Je-Hyun Kim, aims to make a phone that is made up of natural sources which make it environment-friendly once it becomes obsolete and thrown away. Although the idea behind this concept is really good and can actually be a potential help to the environment, this still looks a bit weird. Let’s just hope you don’t get arrested when police see you using this phone. That or being chased down by weed junkies thinking you’ve got real weed. This luxurious phone is also one of the most expensive phones as well. Targeting wealthy people this phone is equipped with high-end technology that suits the rich’s lifestyle by looks and performance. What made this weird, you ask? Well, for one, not all people like certain things. And by certain things, Vertu Signature Touch is also equipped with your choice of exotic reptile or mammal flesh which decorates the back of the phone. When the other phone aims to conserve the environment, this one goes to another path to provide to people who think endangered animals as a fashion trend. To tell the truth, there is no such thing as a weird phone. Weirdness can come in different shapes, sizes and function. There are plenty people all over the world that are equipped with diverse likes and dislikes. What a group of people thinks something is weird, another will think that it’s perfectly normal. Therefore, a weird phone can even become popular among the people. Furthermore, it’s not only how a phone looks that makes it weird. People eventually judge a phone as a whole. So what are the most unusual cellphones have you encountered? Liked this article? Check us out for more!